LOVE 24/7: "You've been let go"
Most of us try to let go of things that no longer benefit us at the top of a new year. There are people and relationships that we let go too, as part of our internal fresh start clean up. But what happens if YOU are the one who has been let go? I have been dismissed far more often than I have ever dismissed anyone. 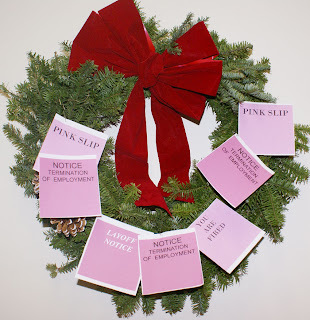 The unedited wreath image used in this post sums up what just occurred in my life. During the holidays, a few people close to me chose to render me obsolete. I have no clue as to why. Things were absolutely affable, amicable and all the rest. No strife, no stress, no reason that I know of as to why I was discarded as no longer profitable or desirable as a friend. The temptation for me to feel rejected and unwanted the last couple of weeks has been very strong.... and yes there have been a few bewildered tears. But I have been determined to look for the silver lining that I know must encircle the cloudy emotions I've been feeling. I thought about my best friends, and how they treat me -- the kind of friends you can go months or even years without speaking to and pick up right where you left off without any sense of awkwardness or hurt.... because you know, truly know, that they love you.... and always will. I decided to stop looking at those who have severed ties with me as being people who obviously don't love me. Instead I am looking at them as my brothers and sisters with whom I share a mutual affection as part of the family of man. Whether or not they show love to me, or even feel it, I know it exists -- because we were created to love one another, pure and simple. What a wonderful opportunity to start the year without the bogged-down feelings of rejection I wrestled with during the holidays, and, as always, to love more fully, deeply, and universally.